There are many steps to completing your new outdoor living space. Once you get over the excitement of envisioning and creating your plan, you will come back to reality and start working on your budget. When it comes to building an attached or freestanding structure as part of your new outdoor living space there are a few routes you can take. Some may explore a pre-fabricated kit that you can build on your own. Others may reach out a landscaping company or general contractor to help build their structure and that’s where we come in. We work directly with any design company or client to help facilitate your vision of your new outdoor living space. But first you need to know the cost of what you want to create. 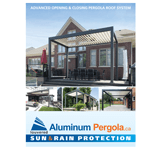 We at aluminumpergola.ca offer a unique structure that offers adaptability that most freestanding pergolas do not offer. All of our aluminum louvered pergolas are custom built to meet your aesthetic expectations along with providing you with a solid, rugged structure that will stand the test of time against the harshest elements and will also add value to your home or business. So what does a pergola cost? Because every project we work on is unique, they all provide different variables that will change the price of your build. Currently in the GTA there is no company that is offering this unique aluminum louvered pergola system with every piece manufactured in Canada. Our competition in the GTA currently orders their pieces from manufacturers in the USA and Europe. From there it gets shipped to Canada and you end up paying the taxes and tariffs on your structure. Current wait times for receiving the pieces from their US manufacturers is one month at the earliest which adds to the total wait time of you having your new pergola to enjoy with your friends and family. Now, because every aluminum louvered pergola we build is custom there are no fixed prices with our installations. The aluminum market fluctuates and we adapt our prices accordingly. Currently our GTA competitors offer a similar product installed for approximately $125-$160 a square foot. Our price point is approximately between 96$-120$ a square foot installed. Again all of our products and manufacturing is here in the GTA and we happily pass the savings on to you. We are also very proud to offer a product that is Canadian made. These prices may change based on the current cost of aluminum on the market but we explain everything to you during your free estimate. When you contact our team we schedule an appointment and come to your home or business to facilitate a free estimate on your aluminum louvered pergola. Our experienced estimator will walk you through any additional costs that may be incurred during the installation such as creating anchor points for the pergola. Once you have made the decision to work with us we manufacture your custom aluminum louvered pergola and install it as requested. Because there are many variables regarding the surrounding area of your outdoor living space there is no way we can average out a cost without seeing your space first. So contact our team today and let us create a unique structure that will add value to your home or business and provide you with a functional space for entertainment and relaxation. Model #2 is available now. Learn what is the difference between two models.